This remarkable fern is shaped like a bowl—or like its namesake, a bird's nest! The long limbs of its foliage grow outward from a central stalk, and all together, the plant can spread up to 4' wide. 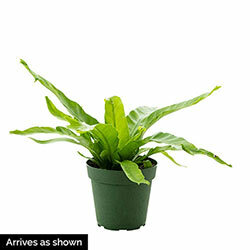 Its impressive size and bright green leaves make it the focal point of any room in the apartment or house. Crissie Bird's Nest Fern is easy to care for and incredibly durable, needing only moist soil and an occasional misting on its leaves. Be careful not to overwater! It will thrive in shady environments, so long as it gets some indirect sunlight. 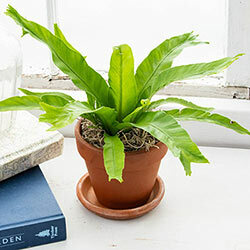 Planting Instructions: Plant and re-pot at the same soil level when the fern's roots fill out the old pot. Soil Requirements: Bird's nest ferns will benefit from damp soil that has good drainage. They can also grow well in soil mixed with pebbles or gravel.